Some lovely moths arrived this morning including one of my top favourites, the Frosted Orange above. Running it close for intricate patterns and satisfying colours is the capucina form (like the coffee and for the same reasons) of the Green-brindled Crescent, below. I thought I had a double when I first looked at the next moth, heading for shelter on our garden table. It looked initially like the standard form of the G-b C. But it was smaller and on closer study proves to a Brindled Green, a relative as well as having such a similar name. Again, the smattering of greens is particularly lovely. The next sequence of three pictures resembles a police 'Wanted' poster. The chance doesn't come too often to portray a moth from a range of angles, like the possible criminals. But this morning the nicest form of that immensely varied moth, the Common Marbled Carpet, did the business most efficiently: top, bottom and sideways on in the 'butterfly' resting position. Note the final picture's beady eye. To emphasise the point about this moth's variability, here below is another form which was slumbering in an adjacent eggbox this morning. Another welcome arrival was the year's first Red-line Quaker, below, an autumnal moth whose caterpillars eat catkins. The red line gives its otherwise austere appearance a bit of dash, don't you think, like a Puritan young woman adding a ribbon to her demure outfit. Finally, another tortrix micro to add to the procession which have crept through these online pages. This one is the Garden Rose Tortrix whose other form, without the dark bell shape on the white 'shirt' was featured several posts ago. A new moth for my list this morning and a very pretty one. I originally thought that this was a small Large Wainscot, tautological I know but I hope you see what I mean. But then Marc Botham of the Institute of Terrestrial Ecology put me right on the excellent Upper Thames Moths blog where I also posted the picture in the hope of confirmation or correction of my guess. The moth is actually a Small Wainscot, officially rated as 'common' but sparse in records this year in our part of the world. It's a lovely little creature with beautifully subtle colouring - though as you can see from the three different studies of the same insect, the camera plays tricks with light, shade and tone. Amidst the hosts of Lunar Underwings which currently hold first place in the eggboxes, a new arrival for me - I think- came last night: the Deep Brown Dart in the two pictures above. At first I thought it was a variant of the Dark Rustic - plenty of those about at the moment, including the one below. But a closer look convinced me that this was a different moth and the DBD seems the best bet. I'm going to check up with the experts on the Upper Thames Moths blog and will hasten back here to correct if I am wrong. Update: Hooray! For once I am right. Current flyers are hardy souls. The temperature at night has plummeted and it's at last becoming possible again to imagine a winter's day, frost, even - shudder - snow. But the moths include some delicate-looking characters such as the Small Dusty Wave - I think again - below. I've also had a call from that lovely moth the Light Emerald (below), abundant earlier in the summer and now successfully into its second brood. With this species that is not uncommon, but an unusually large number of UK moths are producing extra broods this year thanks to our pleasantly lingering summer. Since I started this pot the temperature has risen again, so it's not over yet. More puzzles to end with: I've scratched my head in vain over this unexciting little chap who was fluttering round the graveyard at St Leonard's, Eynsham, where we went researching with a friend who was an evacuee in the village in the Second World War. Update: I am dim. As Dave Wilton kindly points out on the Upper Thames Moths blog, where I made this inquiry, I know this moth very well, albeit usually in its angled-wing resting position. It's a Snout. And the last two moths... Are they yet another variant of the Lunar Underwing? Assistance much appreciated. Update: Yes, they are. By coincidence, another UTM blog enquirer posted two very similar pictures before I had got round to it, so I didn't have to reveal the full extent of my ignorance. This moth is everywhere at the moment, easily the commonest in the trap. In case you're wondering about the title of this post, it's the second line of Keats' ode To Autumn whose opening - 'Season of mists and mellow fruitfulness' - is famous to the point of cliche, and already pillaged for two earlier posts here this month. I'll be most impressed if you knew Line 2. I didn't and, as usual, have Google to thank (even if it's true that they want to take over the world, our minds etc). Anyway, the theme continues to be appropriate as the first of this year's moths with 'autumn' in its name showed up last night. It's the Autumnal Rustic at the top, very smartly-clad in what resembles the uniform of a Confederate army officer in the American Civil War. I also played host to my first Green-brindled Crescent of the year, a beautiful moth in both pattern and colour, and a genuine Pink-barred Sallow (above) after my misidentification of a Centre-barred which Ben put right on Monday. Plus a number of others which I'll look at in more detail tomorrow. Must go shopping now. No moths in this post though the trap is out tonight, the lamp lit and the weather kindly, so we should see normal service resume tomorrow. No, this is about another sort of wild life spotted thanks to a visit from one of my cousins who appears - in part - with Penny in the picture to the left. What on Earth are they doing? You may well ask. 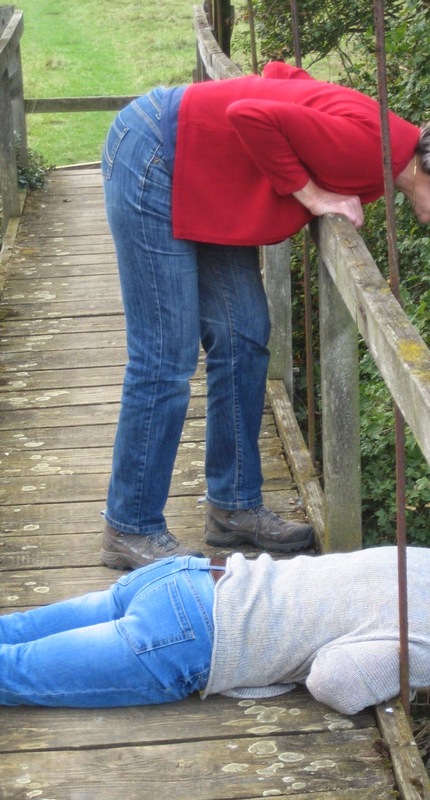 The answer is: monitoring a large crayfish in the weeds below the wonky old suspension bridge above the river Cherwell at Hampton Gay. Here it is, above and below. I apologise for the quality of the pictures but it isn't easy taking a picture of a submerged crustacean from ten feet above on a sunny day. I can complete my Keats quote in the title this morning, after yesterday's Scottish interlude. Before I do, incidentally, I'll add one more point. Moast UK moths and butterflies were named in the late 18th and early 19th century and I guess this accounts for the fact that the ones attributed to Scotland tend to be called 'Scotch'. Nowadays, we get instructed to avoid that form, except when talking about whisky, and use 'Scottish' instead. If this recondite subject catches your interest, read more about it here. And doubless elsewhere on the net. So to the moths; and welcome to the Sallow family whose yellows and tangerines brighten up the eggboxes at this time of the year. This week has brought me the Orange Sallow which heads this post, the plain Sallow which follows and the Pink-barred Sallow below. Update: sorry, it's a Centre-barred Sallow - many thanks to the sagacious Ben Sale of Essex Moths in Comments. Within the same colour spectrum, it was also nice to encounter a (Update: sorry, I forgot to fill this is which is just as well as I was going to put August or September Thorn but actually (thanks to Ben again) it's a Dusky Thorn) and to hold it in the palm of my hand. A lovely moth of a different colour also caused me great pleasure: this Brindled Green whose shades and tones have the subtlety which distinguishes moths from their lovely but sometimes garish relatives, butterflies. It was tucked in the eggboxes while a complete newcomer for me, a Marbled White Spot, below, preferred to roost on the inside of the moth trap's transparent cowl. 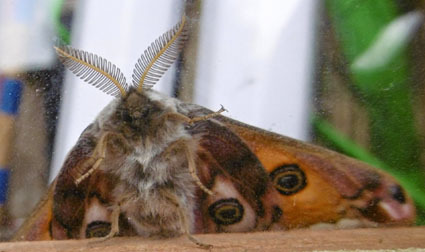 Other arrivals at this abundant time included a Blair's Shoulder-knot, a finely streamlined moth and one of three 20th century immigrant species discovered by a Dr Blair on the Isle of Wight (a favourite arrival point for new species from the Continent) which have since gained a permanent foothold here. The others are Blair's Wainscot and Blair's Mocha. No other British entomologist has had such immortality conferred on their surname. The trio also came in handy during the Blair government, when the doughtiest friend of moths in Parliament, Marilyn Moon MP, was trying to interest the then Prime Minister in the subject. May I finally welcome an Oak Hook-tip, also new for my garden, a Flame Carpet, a Copper or Svensson's Copper Underwing and the visitors below them whose identities I will establish at leisure (and maybe with help from expert readers to whom thanks in anticipation)? Snug as a bug in a r.., sorry eggbox Update: this is a Square-spot Rustic. Thanks Ben! Update: Anthophila fabriciana or the Nettle-tap micro. Ben again. I think the last one may be a Straw Underwing. Update: Nope: Ben puts me right. It's a Turnip moth. But what is this little non-mothy chap, below? Final update and today's last bit of wisdom from Ben: probably an Acorn weevil. I promised a tribute to the Scottish referendum yesterday and here it is. Don't be disappointed if you were attracted here by the headline, though. That subject comes up shortly. First, however, is an appropriate picture which I have entitled 'Union'. The trap on the momentous morning of the result was unusually dominated by Daddy Longlegses or Crane Flies and, as you can see, two of them were doing their best to ensure that this fertile situation happens in future. The lifestyle of a true migrant is rather specialised. Often the gonads are undeveloped when the moth emerges, to save weight on the journey. This makes me every bit as happy as yesterday's result. Edinburgh's ancient reputation as the 'Athens of the North' is evidently alive, well and shared among Scotland's many excellent moth specialists. If I had to name a favourite Scottish moth it would have to be the Rannoch Sprawler, an insect which I imagine draped contentedly in a leather club armchair in a kilt with a pipe, yarning about great battles with salmon or deer in the Highlands. Like Scottish independence, I have yet to see it but wonder if I will one day. 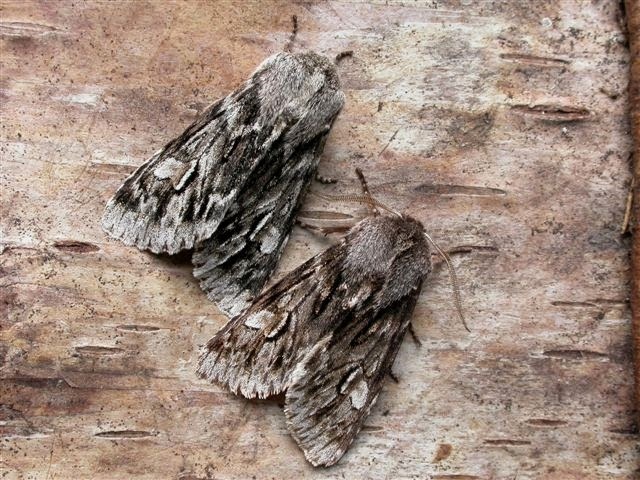 The picture of the moth's two varieties, left, was taken by John Knowler from this excellent website and I'm grateful for its use. I say that because many commentors, not just Alex Salmond, are speculating that the progress of self-government in Scotland can only continue. The referendum defeat may therefore be less of a full stop than a comma. Cue - budum-tish! 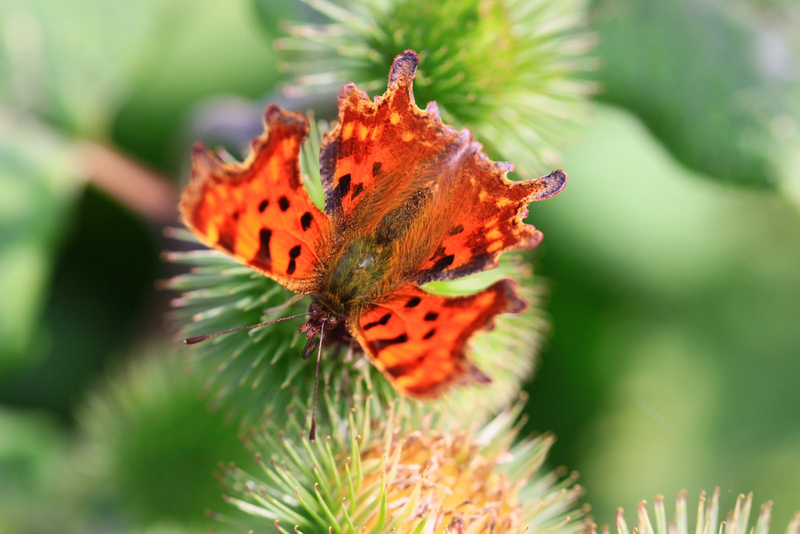 - my final pictures: the first, a very nice one of a Comma butterfly taken in our garden last week by Australian friends who have a very fine camera. The second by me, of a the striking underside of another Comma which, most unusually for a butterfly, spent last night in the trap. And the third a close-up of the same which shows, perhaps encouragingly for Scot Nats, that things are not always as black as they seem. Autumn Moths continue to arrive, some of them suitably russet-coated like this Brown-spot Pinion (I think, unless it's a Beaded Chestnut), below, complete with its fancy striped stockings. I've topped the post with a late survivor of the summer's glories, however, the Ruby Tiger above, almost aflame with colour ans till out enjoying these warm September nights. Next we have a micro in autumnal hues, a Large Fruit Tree Tortrix or Arcgips podana. We have a little collection of apples and plums so this is a predictable visitor but no less welcome for that. And finally a quartet of Beaded Chestnuts - or are they Brown-spot Pinions?